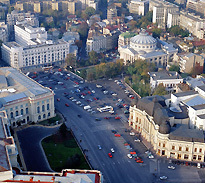 BUCHAREST, Romania's largest city and capital,is today a bustling metropolis (which in the 1900s earned its nickname of "Little Paris") . a) Firstly by bus EXPRES 783 (the station is in front of the arrivals terminal) till Piata Universitatii or Piata Victoriei station. b) By cabs, Fly Taxi, the official airport taxi carrier. The duration is between 30 and 50 minutes (depending on traffic). Traveling by train from other European countries to Romania takes from 6 hours (Budapest to Timisoara) to about 46 hours (London to Bucharest). Most train tickets allow several stopovers en route so train travel can be an affordable and relaxing way to include Romania in a European trip.